In my recent report, "Why Voting Matters," I show the dramatic differences in opinion between voters and nonvoters, and argue that more voter turnout would lead to more progressive policies. 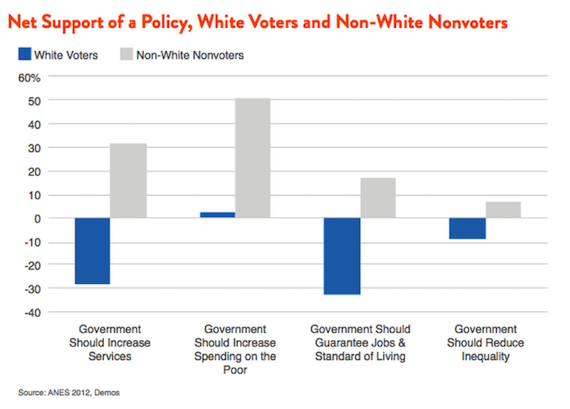 One of the most dramatic gaps in opinion is between white voters and non-white nonvoters (shown below). As 2016 approaches, the question of how to mobilize the political power of people of color is increasingly being discussed with the rise of groups like Black Lives Matter. Though it’s clear that voter turnout will not be enough to fully realize political equality, it can have a dramatic influence on policy. A fascinating working paper from Brazil sheds more light on the importance of voting -- and making voting as easy as possible. The paper examined a re-registration program in Brazil that affected 1,186 municipalities. The program pulled down registration rates by 10 points and turnout by 5 percentage points in the affected districts. 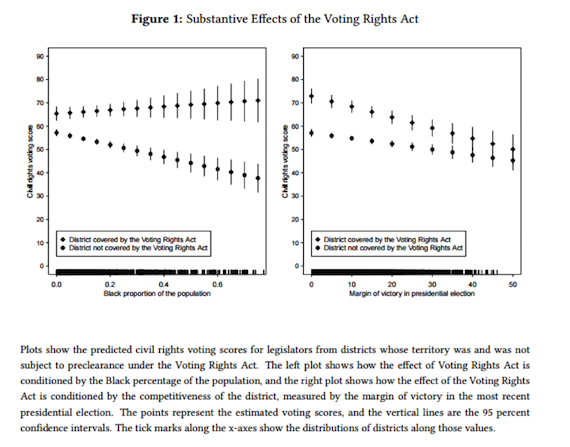 The authors find that the effect was dramatic: “The newly elected mayors responded to this change by reducing public expenditure in areas that disproportionately benefit poor and uneducated voters (education and health).” Although the paper is still in the working-paper stage, it finds support from other similar studies: One from Princeton economist Thomas Fujiwara finds that the adoption of new electronic voting technology in Brazil, which boosted turnout among less-educated citizens, led to more government spending on healthcare. The result was increased prenatal visits, and therefore a reduction in low-weight births among less-educated women. This is not to say that voter turnout would entirely solve our entrenched political biases. The donor class, for instance, is overwhelmingly white, and politicians respond disproportionately to the preferences of donors. But they also respond disproportionately to voters. And voters are disproportionately white. I recently noted that non-Hispanic whites made up 76.3 percent of the electorate in 2014, while with equal turnout they would have made up 69.9 percent of voters, a difference of 6.4 points. For comparison, the change in the white share of the electorate dropped from 82.5 percent in the 1996 midterm, a 6.2 point difference. To put it another way, equalizing turnout would have a result equivalent to nearly two decades of demographic change. The solution to our voting crisis is universal same-day registration and robust enforcement of the National Voter Registration Act, combined with automatic voter registration where the technological capability exists. In addition, Congress must restore the vital preclearance provision of the Voting Rights Act. 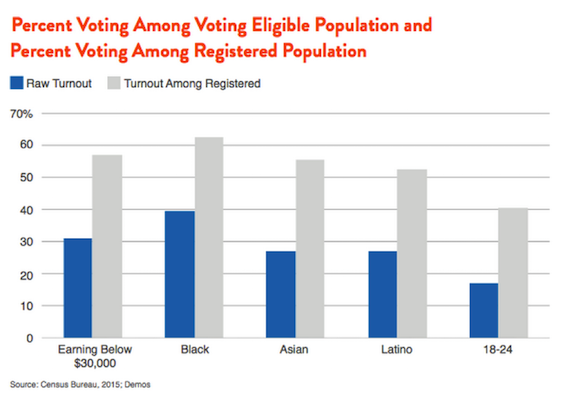 Finally, nonpartisan GOTV operations and voter awareness drives can boost turnout. Bolstering the political power for people of color is a long-term project that involves removing many of the distortionary barriers to participation in our political system. A key step is boosting voter turnout. As the nation becomes diverse, its electorate must become more diverse as well. More inclusive turnout will lead to policies that better represent the needs of all Americans.